A total of 8.8 million households bought homes in the two years preceding the most recent American Housing Survey (AHS). The survey, sponsored by the Department of Housing and Urban Development, is conducted by the Census Bureau every two years. The AHS is a nationally representative survey of residential structures in the US and of the households that occupy them. Results of the 2017 survey were released last year and the National Association of Home Builders (NAHB) has taken a detailed look at the findings, publishing several blog entries. 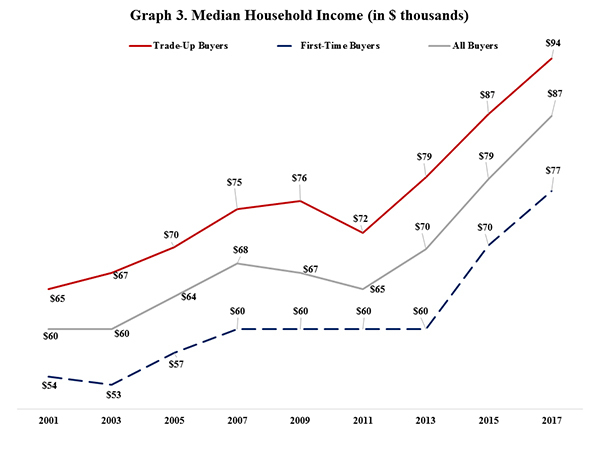 Carmel Ford of NAHB’s Economics and Housing Policy Group has now published a paper on the characteristics of those recent buyers and their transaction. 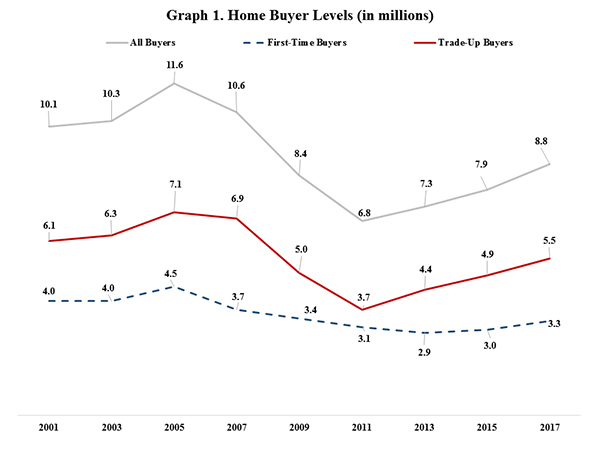 The 8.8 million homebuyers are the highest tallied by any AHS since the Great Recession. There were 11.6 million identified in the 2005 AHS, but the number fell to a low of 6.8 million in 2011. It has been climbing since then to 7.3 million in 2013, and 7.9 million in 2015. Ford breaks the total into two subsets, the 3.3 million who were first-time buyers and the 5.5 million trade-up buyers. While the total number of buyers is up from the 2015 survey, the gain is among trade-up buyers who likely benefited from the rise in home prices which provided an opportunity to build equity and “trade-up” to new homes. The share of first-time buyers ticked down from 39 percent in 2015 to 37 percent. The AHS gathered a lot of details which Ford has summarized in the NAHB report. They cover demographic characteristics and details about what, how, and with what they purchased their home. Here are a few of the highlights. The typical buyer was 40 years old, buyers. 32 for first timers and 47 for repeat buyers. The median income across all buyers was $86,623, about $8,000 more than in 2015. There was about a 20-percentage point spread between the incomes of first-time and trade-up buyers; $93,761 versus $77,212. Recent home buyers had an average of 2.72 persons in their household. Twenty-seven percent were racial or ethnic minorities, little changed from the previous survey, but first-time home buyers are more diverse, at 34 percent minority versus only 22 percent of trade-uppers. The median price of a home purchased prior to the 2017 AHS was $228,389, up 10 percent from $208,573 in 2015. The median size was 1,890 sq. ft., 10 feet smaller than the 2015 home, but first-timers purchased homes 400 sq. ft. smaller than the median while trade-up homes were a median of 2,070 sq. ft.
Eleven percent of homes were purchased without a down payment, the same as in 2015. Fifty-two percent of buyers made their downpayment out of savings or cash on hand, 26 percent used proceeds from the sale of their previous home, 3 percent acquired the home as an inheritance or a gift. 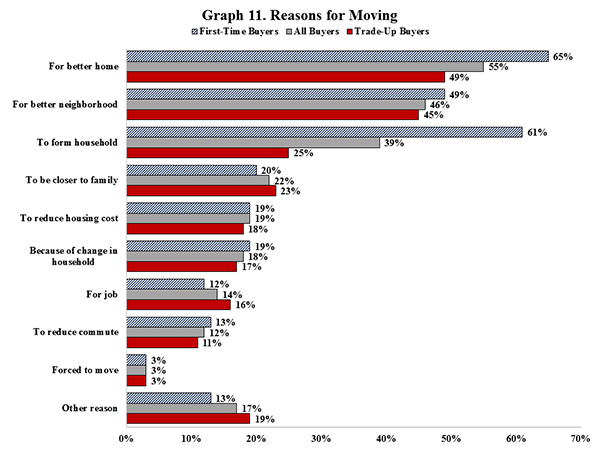 The Top reasons why recent home buyers decided to move were ‘for a better home’ (55 percent), to ‘for a better neighborhood’ (46 percent), and to ‘form a household’ (39 percent). But the share of the various reasons given differed among the two types of buyers.